Background The management of hip instability because of septic arthritis in childhood is difficult. Ilizarov hip reconstruction (IHR) is a double-level femoral osteotomy with the objective of eliminating hip instability, through a proximal valgus extension–derotation osteotomy, and a distal varization-lengthening osteotomy for mechanical axis correction and equalization limb length. Patients and methods IHR was performed for 16 adult patients with complaints of hip pain, leg-length discrepancy, limping, reduced activity, and limited abduction of the hip as a result of childhood septic arthritis. Their ages ranged from 19 to 32 years (mean 23.2±4.2 years). Results Ilizarov external fixator was used in all cases. 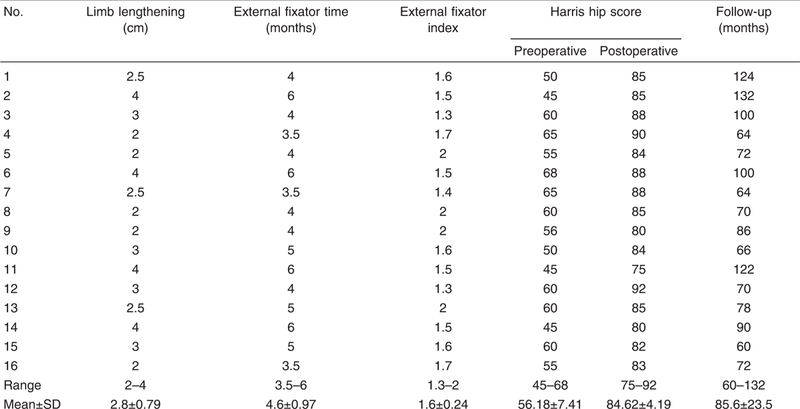 At the time of last follow-up, which ranged from 60 to 132 months (mean 85.6±23.5 months), the Harris hip score showed excellent functional outcome in two (12.50%) cases, good in 13 (81.25%) cases, and fair in one (6.25%) case. There was no poor functional outcome in any case. Preoperatively, the mean Harris hip score was 56.18 points, and at the time of last follow-up, it improved to a mean of 84.62 points. Pain subsided in all patients, the Trendelenburg sign became negative in all but three (19%) patients, no patient had limb-length discrepancy, and the alignment of the extremity was reestablished in all cases. No additional operations were required. Conclusion IHR is a valuable and durable solution for the late sequelae of childhood septic arthritis of the hip presenting in adult patients. The late sequelae of septic arthritis of the hip in childhood represent a complex problem. The presenting symptoms are limping with or without pain, limb-length discrepancy (LLD), deformity, hip stiffness, and difficulty with marital relationship especially for female patients. The management of hip insufficiency in young adults is controversial owing to the patients’ expectations of treatment, high activity level, and their young age. Arthrodesis of the hip joint offers a stable, painless but immobile hip joint which makes sitting on a chair and public transportation difficult, renders perineal hygiene difficult, and impedes a normal marital relationship. Moreover, conversion of a fused hip into total hip arthroplasty is challenging and carries the risk of recurrent infection. Arthroplasty would solve the problem of immobility met with arthrodesis but may not be the ideal choice for young patients owing to the increased activity and the need for frequent revisions ,,,,. Pelvic support osteotomy (PSO) was described to solve the problems of hip insufficiency with the idea of transferring the body weight to the femoral shaft through a valgization osteotomy . Although this osteotomy can provide sufficient pelvic support, it results in lateralization of the mechanical axis and did not address the problem of LLD . Ilizarov added a second, more distal femoral osteotomy used for lengthening and varization to restore the overall mechanical axis of the lower limb . This study presents our midterm (>5 years follow-up) results of Ilizarov hip reconstruction (IHR) using the Ilizarov external fixator for adult patients who have unilateral hip insufficiency as a sequela of chronic septic arthritis of the hip in childhood. The cases of 16 adult patients constitute the material of this retrospective study. Their ages ranged from 19 to 32 years (mean 23.2±4.2 years). There were nine male and seven female patients. The inclusion criteria were having a unilateral hip insufficiency as a sequela of chronic septic arthritis of the hip in childhood and with a minimum postoperative follow-up of 5 years. Excluded from the study were noncooperative patients owing to mental or psychological disorders and morbidly obese patients. 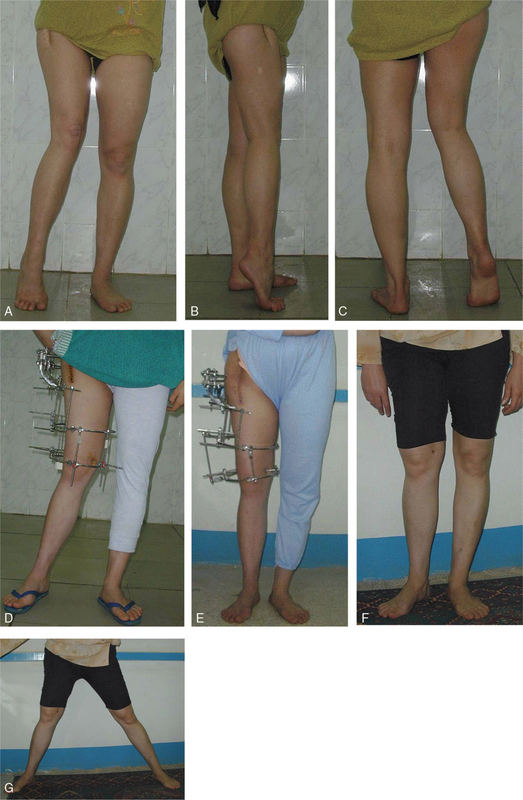 The presenting symptoms were limping with or without pain, leg-length discrepancy, deformity, hip stiffness, and difficulty with marital relationship ([Figure 1]a). Figure 1 (a–c) Preoperative clinical photographs of a 32-year-old female patient with sequelae of septic arthritis in childhood affecting the right hip joint. The patient had flexion, adduction, and internal rotation deformities and apparent limb-length discrepancy of 12 cm. (d) Postoperative photograph shows application of Ilizarov frame, valgization of the lower limb due to the proximal osteotomy, and reduction of the limb-length discrepancy to 4 cm after undoing of hip ankylosis. (e) A photograph after 4-cm lengthening and varization for correction limb alignment. (f, g) Follow-up photographs show the functional outcome. Clinical evaluation included general examination of the medical profile and patient’s expectations from the treatment and his or her needs in daily life activities. Local examination was done to detect the hip mobility or stiffness, presence of pain, scars of previous surgery or sinuses of infection, fixed pelvic obliquity, fixed deformities, neuromuscular status of the lower limb, and apparent LLD (by the block method while standing using multiple blocks under the shorter foot until the patient feels both limbs equal). Radiological evaluation included plain radiographs obtained for the lumbosacral spine (to detect fixed scoliotic deformity), pelvis, and hip joints. Computed tomography scan of the pelvis and both hip joints was obtained for better evaluation of the hip joint regarding the location of the femoral head relative to the acetabulum and presence of fibrous or bony ankylosis of the joint. The procedure was performed with the patient in the supine position with a bump under the sacrum and ischium. Adductor tenotomy was performed through a medial approach. Mobilization of the hip was performed by undoing the ankylosis through a limited anterolateral approach to the hip and under image intensifier, where the remnants of the femoral head were removed piecemeal using a bone rongeur. The affected limb was maximally adducted crossing over the other limb so that the upper part of the femur was seen parallel to the lateral wall of the pelvis on the affected side and abutting against the ischium, and that point was marked as the site of the proximal osteotomy. With the limb maximally adducted, the proximal half pins were inserted perpendicular to the sagittal plane of the patient’s body and parallel to the horizontal plane. To those half pins, was attached a block formed of one small and one large arches from the Ilizarov frame. The limb was then brought back to the normal position and a preconstructed Ilizarov frame was applied to the femur distal to the proposed proximal osteotomy with the pins inserted perpendicular to the mechanical axis of the distal femur. Through a stab wound, the proximal osteotomy was performed using the multiple drills method and completed by a narrow osteotome. Holding both the proximal block and the distal part of the frame, the osteotomy was manipulated to create a valgus extension–derotation osteotomy, in that order to avoid displacement and loss of bone contact. Then the proximal and distal parts of the frame were connected using threaded rods and oblique supports. The distal osteotomy was performed percutaneously using multiple drills. The level of the distal osteotomy was preoperatively planned so that the mechanical axis of the lower limb passes through the acetabulum and the knee joint line horizontal after varization of the distal femur. Mobilization of the patient was allowed when the postoperative pain subsides, and the patient was encouraged to mobilize his lower limb joints and bear weight as tolerated. The needed limb lengthening was estimated using the block method, keeping in mind the possibility of fixed pelvic obliquity. Distraction of the distal osteotomy was started after 5–7 days at a rate of 1 mm per day until the LLD was corrected, then a pair of hinges was attached for varization of the distal segment ([Figure 1]b, c and d). After consolidation of the osteotomies, the frame was usually removed without anesthesia as an outpatient procedure and no cast was applied. [Figure 2] demonstrates the procedure radiologically and the follow-up result. Figure 2 (a, b) Preoperative plain radiograph and computed tomography scan show destruction of the femoral head and acetabulum and fibrous ankylosis as a result of septic arthritis of the right hip in childhood. The radiograph shows evidence of hip adduction, flexion (nonvisualized obturator foramen), and internal rotation (nonvisualized lesser trochanter). (c, d) Radiographs during treatment show the proximal and distal osteotomies, lengthening, and varization through the distal osteotomy. The knee joint-orientation line is horizontal, and proximal extension of the mechanical axis of the distal femur passes through the acetabulum. (e) Follow-up radiograph shows the consolidated osteotomies and maintained alignment. The functional outcome was graded according to the Harris hip score (HHS), which has a total of 100 points. Pain receives 44 points; function, 47 points (activities of daily living receives 14 points and gait 33 points); range of motion, five points; and deformity, four points. A total score less than 70 points is considered a poor result, 70–79 a fair result, 80–89 a good result, and 90–100 an excellent result . Radiologically, the follow-up radiographs were examined for orientation of the knee joint line and restoration of the overall mechanical axis of the lower limb, so that extension of the mechanical axis of the tibia and distal femur should pass through the acetabulum with a horizontal knee joint-orientation line. Statistical analysis was done using SPSS version 11.0.1 for Windows (SPSS Inc., Chicago, Illinois, USA). The one-sample t-test was used for dependent variables means comparison, and one-way analysis of variance test and its nonparametric equivalent, the Kruskal–Wallis test, were used for variables that were small and not normally distributed. A P value up to 0.05 was considered to be statistically significant. There were 16 patients treated for hip insufficiency using the IHR and Ilizarov external fixator. Their ages ranged from 19 to 32 years (mean 23±4.2 years). There were nine (56%) male and seven (44%) female patients. The right side was affected in nine (56%) cases and the left side in seven (44%) cases. Fixed flexion deformity of the hip was present in all cases and ranged from 20° to 45° (mean 32.8°±7.9°). Fixed adduction contracture of the hip was present in 11 (69%) cases and ranged from 10° to 25° (mean 16.8°±5.1°). Fixed internal rotation deformity was present in eight (50%) cases and ranged from 5° to 15° (mean 10.6°±3.2°). Preoperative LLD was present in all cases and ranged from 3 to 12 cm (mean 5.6±2.3 cm); postoperatively after undoing of hip ankylosis and fixed deformities, this shortening was reduced to 2–4 cm (mean: 2.8±0.8 cm) as measured clinically by the block method ([Table 1]). Undoing of the hip ankylosis significantly (P≤0.001) improved the apparent preoperative LLD. Limb lengthening was performed, in all cases, through the distal femoral osteotomy to compensate for the residual limb shortening. The mean external fixator time (the time spent in the external fixator) was 4.6±0.97 months. The mean external fixator index (the external fixator time divided by the lengthened segment in centimeter) was 1.6±0.24. The follow-up ranged from 60 to 132 months (mean 85.6±23.5 months). At the time of last follow-up, the HHS showed excellent functional outcome in two (12.50%) cases, good in 13 (81.25%) cases, and fair in one (6.25%) case. There was no poor functional outcome in any case. Pain subsided in all patients, the Trendelenburg sign became negative in all but three (19%) patients, no patient had LLD (as measured clinically by the block method), and the alignment of the extremity was reestablished in all cases. Preoperatively, the mean HHS was 56.18±7.41 points and at the time of last follow-up, it improved to a mean of 84.62±4.19 points ([Table 2]). Improvement of the functional outcome had a very high statistical significance (P≤0.001). The functional outcome was insignificantly better in male than female patients, when the apparent LLD was less than 6 cm, when the distal femoral lengthening was less than 3 cm, and when the external fixator time was maximally 4 months ([Table 3]). Superficial pin-tract infection occurred in all cases and was managed by frequent pin site care and oral antibiotics. No cases of deep infection or neurovascular injury occurred as a result of this treatment. At the time of last follow-up, three patients complained of lurch while walking; however, no additional procedures were required. Resection arthroplasty (Girlestone) has been described for alleviation of pain and improvement of hip function; however, this arthroplasty results in an unstable hip, LLD, and functional disability . PSO was introduced to improve hip stability by directly transferring the body weight to the distal femur and to relieve pain by offloading the stump of the femoral head ,,. The aim of PSO is to support the pelvis on the femur, reduce lumbar lordosis, and increase the distance of the greater trochanter from the pelvis, which tightens the gluteus medius muscle and prevents Trendelenburg’s limp ,. Milch described a similar angulation osteotomy, with the addition of femoral head resection in patients with anterior dislocation who had developed arthrosis . A shortcoming of PSO is the valgization of the lower limb putting much stresses on the knee joint and it does not address the LLD . Ilizarov added another distal osteotomy to restore the orientation of the knee and ankle joint lines in the coronal plane and to allow femoral lengthening while the proximal osteotomy lateralizes and distally displaces the greater trochanter and in so doing increases the efficiency of the abductor muscles . A successful IHR reduces limp through abolishing the Trendelenburg lurch (owing to elimination of any further adduction between the femur and the pelvis which then prevents pelvic drop during the single stance phase of gait), equalizes limb length and facilitates a more energy-efficient gait through the stability provided to the hemipelvis ,,,,,,,. It has been recommended that the hip joint should be mobile or the femoral head absent for a successful PSO. In our patients, we performed resection of the femoral head remnants for mobilization of the hip joint, and this served several purposes by correction of the fixed deformities, correction of the limb shortening resulting from the fixed deformity, and allowed maximum adduction of the limb so that a Trendelenburg gait is abolished owing to blockage of any further adduction. Our patients had a mean preoperative LLD of 5.6±2.3 cm (range: 3–12). The length discrepancy caused functional and esthetic problems. Most of the preoperative LLD was corrected after hip mobilization, then re-estimation of the required limb lengthening was performed postoperatively by the block method to avoid over-lengthening owing to the fixed pelvic obliquity. In all patients, the LLD was clinically corrected through the distal osteotomy followed by varization to re-align the lower limb. Postoperative radiographs showed correction of the mechanical axis deviation, lateral distal femoral angle, and medial proximal tibial angle in all patients. In our study patients, the HHS improved significantly compared with the preoperative evaluation. Similarly, several studies have confirmed the beneficial effects of IHR in both clinical and imaging and by gait analysis studies. The improvement in HHS after IHR has been attributed to the increased hip abductor muscle mass after PSO (documented with MRI studies) and the decreased joint reaction forces (as confirmed by gait analysis parameters) ,,,.A biomechanical study by Inan et al. proved that distal and lateral translation osteotomy of the greater trochanter following traditional PSO increases the length of the abductor moment arm more than that obtained by traditional PSO alone. In our study, residual lurching gait was present in three (18.7%) cases and it was clinically significant in only one of them (6.2%). Therefore, we believe that the addition of a greater trochanter osteotomy would add another morbidity and delay rehabilitation unless rigidly fixed; moreover, it adds the risk of displacement or nonunion and loss of an effective abductor lever arm. The main adverse effect of IHR osteotomy is the altered anatomy of the proximal femur after PSO, in both sagittal and frontal planes, which would significantly increase the difficulty of a possible future total hip replacement (THR). However, Thabet et al. reported a successful THR 15 years after a PSO, and they concluded that the altered anatomy of the proximal femur after PSO did not preclude subsequent THR; however, THR can be tricky, and careful attention to the surgical details is necessary to achieve a successful outcome. In the light of our midterm results (60–132 months), we believe that IHR is a valuable and durable solution for the late sequelae of childhood septic arthritis of the hip presenting in adult patients. Baghdadi T, Saberi S, Sobhani Eraghi A, Arabzadeh A, Mardookhpour S. Late sequelae of hip septic arthritis in children. Acta Med Iran 2012; 50:463–467. Forlin E, Milani C. Sequelae of septic arthritis of the hip in children: a new classification and a review of 41 hips. J Pediatr Orthop 2008; 28:524–528. Manzotti A, Rovetta L, Pullen C, Catagni MA. Treatment of the late sequelae of septic arthritis of the hip. Clin Orthop Relat Res 2003; 410:203–212. Hunka L, Said SE, MacKenzie DA, Rogala EJ, Cruess RL. Classification and surgical management of the severe sequelae of septic hips in children. Clin Orthop Relat Res 1982; 171:30–36. Thabet AM, Catagni MA, Guerreschi F. Total hip replacement fifteen years after pelvic support osteotomy (PSO): a case report and review of the literature. Musculoskelet Surg 2012; 96:141–147. Milch H. The ‘pelvic support’ osteotomy. J Bone Joint Surg Am 1941; 23:581–595. Rozbruch SR, Paley D, Bhave A, Herzenberg JE. Ilizarov hip reconstruction for the late sequelae of infantile hip infection. J Bone Joint Surg Am 2005; 87:1007–1018. Ilizarov GA. Transosseous osteosynthesis. Berlin: Springer-Verlag. 1992. Harris WH. Traumatic arthritis of the hip after dislocation and acetabular fractures: treatment by mold arthroplasty. An end result study using a new method of result evaluation. J Bone Joint Surg Am 1969; 51:737–755. Oheim R, Gille J, Schoop R, Mägerlein S, Grimme CH, Jürgens C, Gerlach UJ. Surgical therapy of hip-joint empyema. Is the Girdlestone arthroplasty still up to date? Int Orthop 2012; 36:927–933. Cheng JC, Lam TP. Femoral lengthening after type IVB septic arthritis of the hip in children. J Pediatr Orthop 1996; 16:533–539. Gürsu S, Demir B, Yildirim T, Er T, Bursali A, Sahin V. An effective treatment for hip instabilities: pelvic support osteotomy and femoral lengthening. Acta Orthop Traumatol Turc 2011; 45:437–445. El-Mowafi H. Outcome of pelvic support osteotomy with the Ilizarov method in the treatment of the unstable hip joint. Acta Orthop Belg 2005; 71:686–691. 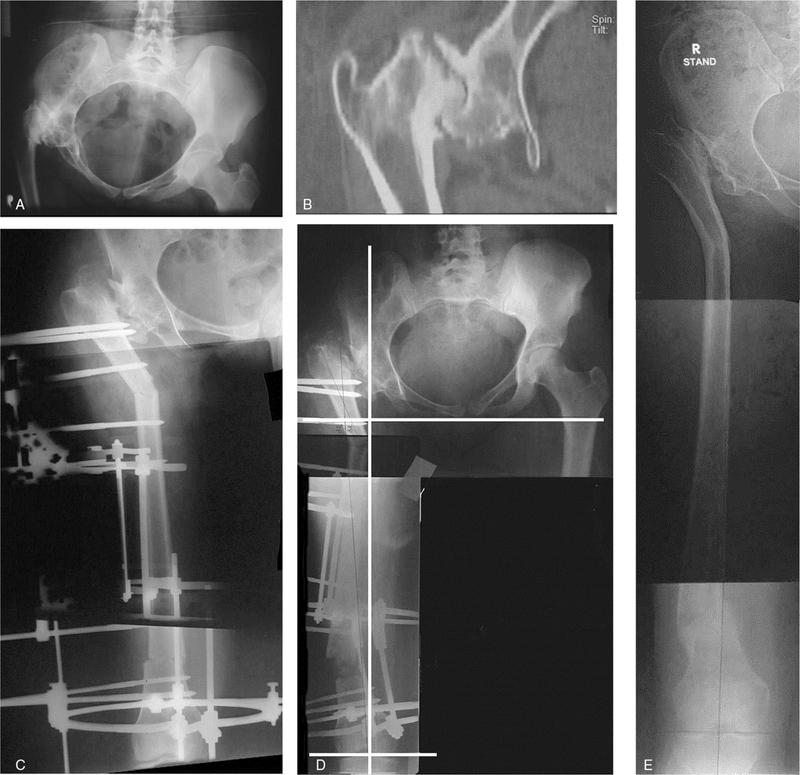 Marimuthu K, Joshi N, Sharma CS, Bhargava R, Meena DS, Bansiwal RC, Govindasamy R. Ilizarov hip reconstruction in skeletally mature young patients with chronic unstable hip joints. Arch Orthop Trauma Surg 2001; 131:1631–1637. Mahran MA, Elgebeily MA, Ghaly NA, Thakeb MF, Hefny HM. Pelvic support osteotomy by Ilizarov’s concept: is it a valuable option in managing neglected hip problems in adolescents and young adults? Strategies Trauma Limb Reconstr 2001; 6:13–20. Mandar A, Tong XB, Song SH, Park YE, Hong JH, Lee H, Song HR. Pelvic support osteotomy for unstable hips using hybrid external fixator: case series and review of literature. J Orthop Sci 2012; 17:9–17. Kocaoglu M, Eralp L, Sen C, Dinçyürek H. The Ilizarov hip reconstruction osteotomy for hip dislocation: outcome after 4–7 years in 14 young patients. Acta Orthop Scand 2002; 73:432–438. Inan M, Alkan A, Harma A, Ertem K. Evaluation of the gluteus medius muscle after a pelvic support osteotomy to treat congenital dislocation of the hip. J Bone Joint Surg Am 2005; 87:2246–2252. Inan M, Mahar A, Swimmer T, Tomlinson T, Wenger DR. Changes in the lengths of the gluteus medius and gluteus minimus muscles with trochanteric transfer following pelvic support osteotomy: a biomechanical study. Acta Orthop Traumatol Turc 2004; 38:67–70.